“If you’re not outraged, you’re not paying attention,” read Heyer’s last public post on Facebook. The woman who was killed in Charlottesville, Virginia, on Saturday when a car plowed into a group of anti-racist demonstrators was “murdered while protesting against hate,” says a GoFundMe page set up by a family friend. Ms Heyer was a civil rights activist and a Bernie Sanders supporter. As of late Sunday morning, more than $80,000 had been been pledged to the GoFundMe campaign. According to the page, Heyer was a graduate of Willam Monroe High School in Stanardsville, located about 25 miles north of Charlottesville. A neighbor of Heyer’s, who declined to be named, said on Sunday morning that the woman was well known locally. “It was just terrifying,” 23-year-old Thomas Pilnik told HuffPost. The Associated Press reported that Heyer had been “crossing the street” when she was killed. At least 19 others were injured in the crash, some critically, said police. Many took to Twitter to pay homage to Heyer. Rep. Keith Ellison (D-Minn.), actress Janelle Monae and comedy writer Bess Kalb were among those who praised the young woman for her bravery and for standing up against hate. Many also noted the poignancy of Heyer’s last public Facebook posting. “If you’re not outraged, you’re not paying attention,” Heyer shared in November. A candlelit vigil is being planned for Heyer in Charlottesville on Sunday evening. Hundreds on Facebook have expressed their desire to attend. 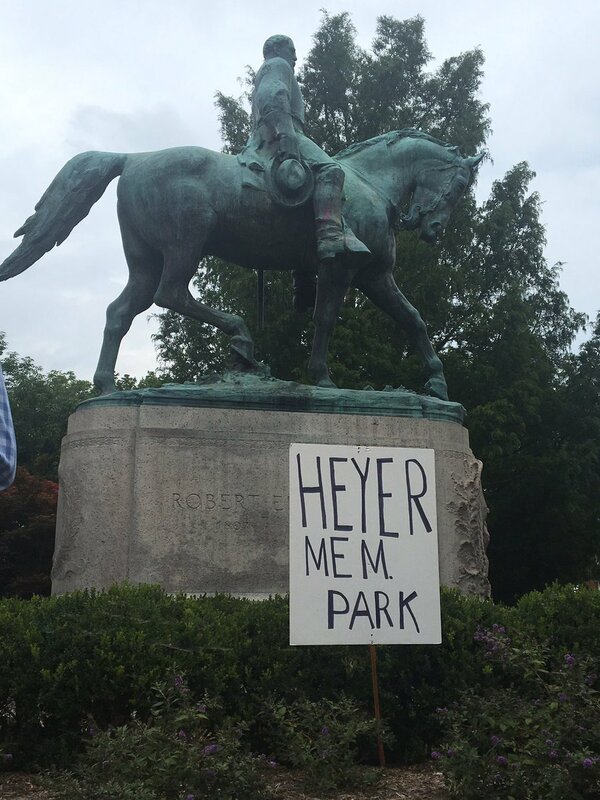 Maybe it would be a good idea for the city of Charlottesville to replace the statue in Emancipation Park of slave owner, slave plantation manager, and warrior for slavery on American Civil War battlefields General Robert E. Lee with a monument for Heather Heyer? UPDATE: Someone in Charlottesville also had that idea. Charlottesville Suspect Attended Rally With White Supremacists, Photo Shows. One of James Alex Fields Jr.’s former teachers recalled him being “infatuated with Nazis”: here. The night before, hundreds of Nazis took over the University of Virginia campus and held a torchlight march, chanting “one people, one nation, end immigration,” “sieg heil” and “blood and soil,” an anti-Semitic chant used by the German Nazis. Trump Is Criticized for Not Calling Out White Supremacists: here. This entry was posted in Crime, Racism and anti-racism and tagged nazis, Virginia by petrel41. Bookmark the permalink. What happened in Charlottesville, Virginia was heinous. Mary, this is the most significant display of Trump-empowered white nationalism the country has so far seen–and people all over are rightfully devastated and alarmed. This is a national emergency and all of us need to show up. That’s why UltraViolet is joining our friends at Indivisible, MoveOn, and many more groups–dozens of actions are organized around the country throughout the weekend and we need you there to send the message: We will not go backward, and we will not be afraid. Find an event near you now. Or plan an event in your community.